Pakawaste can offer you a full range of 2 or 4 wheel wheelie bins which are certified according to EN840 and ready to be customised with optional extras. Within our Waste Wheelie Bin range, we have many standard colours such as grey, green, brown, yellow, red and blue with other colours available upon request. As well as that, replacement parts are available for our full range of waste bins. 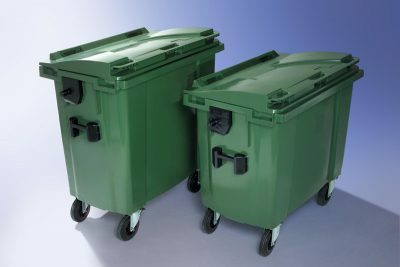 Our bins are available in different sizes ranging from 60 Litre to 1100 Litre in plastic or steel. Clinical bins are available in the following sizes: 240L, 340L, 360L, 660L, 770L and 1100L. 2 Wheel – mechanical lid opening, locking device, various recycling apertures. For more information about our waste bins, please contact the Pakawaste team today!